Among low (or no) budget filmmakers, there is something of a mystique surrounding geared lenses and follow-focuses. For many years, I read about them, understood them in principle, but never tried them. This was partly because I repurposed still lenses that aren’t geared. But still lenses can be easily adapted to use gears. The real reason I never tried a follow focus was the outrageous cost of a “quality” unit. It’s common for a follow focus to start around $500 and not hard to find them listing over $1,000. This always seemed outrageous to me. A follow focus is a just a knob attached to a gear that needs to mesh with another gear. Beyond that, common niceties are ability attach a whip, one or more hard stops and a way to temporarily mark any number of “soft” focus points. None of these features need add up to the price of a decent camera. Besides, how much of a difference would it really make? Then I got the chance to work with cinema lenses and a follow focus. From the very first shot I was aware of what I had been missing. I could never go back. Silky smooth, repeatable manual focus with the control right where I needed it. But how could I afford to shoot this way all of the time? On the lens side of the equation, the Rokinon Cine-styles allowed me to acquire geared cinema primes at prices mortals can afford. Now to find a reasonably priced follow focus. I first dabbled with the Hondo $50 follow focus. While I appreciate their effort to create such an inexpensive piece of gear, and the good folks at Hondo obviously care about their craft, it really didn’t work for me. I found myself constantly fiddling with it to keep it tight against my lens (they have a new version which is supposed to be better at this), and the handle (which will eventually bump against your rig) just isn’t comparable to handling a nice big knob that can turn 360º. I found myself missing shots because I was fiddling with the follow focus. Still, if $50 is all you can afford, it’s worth a look. 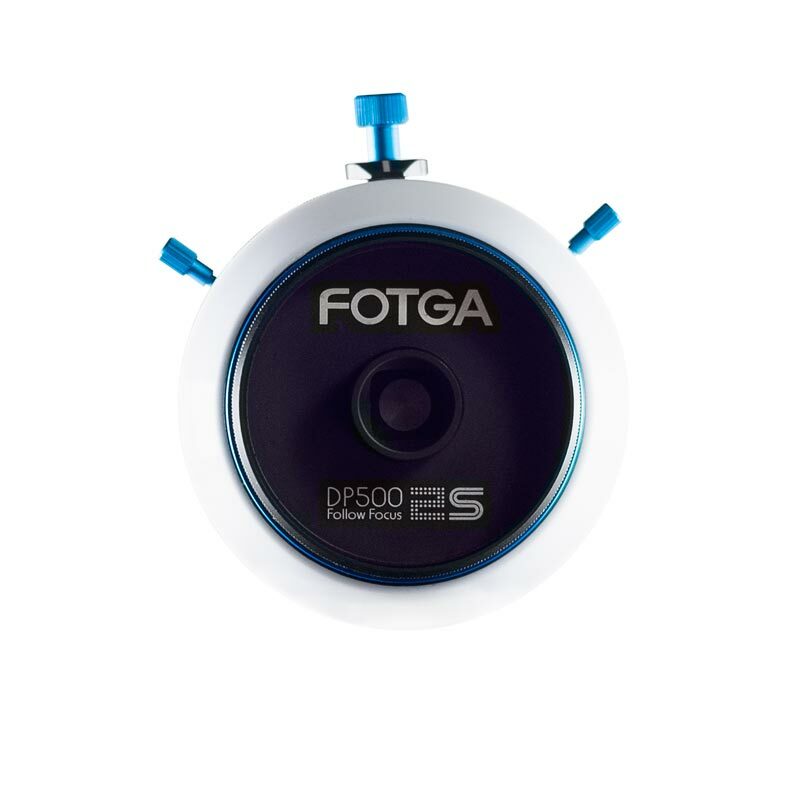 Then I stumbled upon a review of the inexpensive FOTGA DP500IIS. The claim that it had no backlash (the delay between turning the knob, and the lens actually turning) made me decide to give it a shot. I’m so glad I did because I couldn’t be more impressed with this piece of kit. The whole thing is made of strong*, light weight aluminum except for the magnetized focus ring. It has two hard stops. It has an awesome quick-release snap mechanism for mounting to your 15mm rails. (No need to remove matte box, etc. in order to slide it off.) It stays exactly where you leave it, snug against lens. You can reverse it for left or right hand use. You can switch gear sizes. In short, it does everything you need a manual follow focus to do, and it does so very well. And as others have said, there is zero backlash. The finest turn of the knob will immediately translate to action at the lens. Put simply: Unless you have need of some esoteric feature missing from the FOTGA, there is absolutely no reason to spend any more money on any follow focus. * A couple of weeks ago, I dropped my rig in a parking lot. Hard onto concrete. The DP500IIS took the brunt of the fall, and surely saved my camera. The arm that attaches the knob/gear assembly to the base was severely bent, but beyond that the follow focus was completely fine. I contacted FOTGA to get a replacement part. In the meantime, I disassembled it, bent the arm back in a vice, and it amazingly it works good as new. UPDATE: We have a winner! “Anna” from I don’t know where is lucky number 118. (Drawn from a collection of golden lens caps stored in an underground vault protected by the ghost of Alfred Hitchcock.) Congrats to Anna, may she never miss focus again! Not only did FOTGA send me a new arm, but they sent me a whole new follow focus. Since I already have two, I’ve decided to give this one away. If you’d like a chance to win it, leave a comment below. (Make sure you register so that I have some way to contact you.) In two weeks, I’ll pick a winner at random from one of the comments. 130 Replies to "GEAR REVIEW: FOTGA DP500IIS Quick Release Follow Focus"
Also, I was really looking to get that jar opener follow focus thingy. I guess a real follow focus would be even nicer. Great review! Would love to win one, aspiring college filmmaker here! My son, Sean would love to own this follow focus. Thanks again Joe! A very well thought-out review. I would be curious to hear more about your experience with the hard-stops. Did they work well for you? They work great. Once you’ve found your mark, you tighten the screw where you want to stop. Easy, perfect focus every time. It is such a simple feature, I really don’t understand why every follow focus doesn’t do this. Hope I am the lucky lucky winner! Very nice review. Thanks for the opportunity! This would be a godsend! I’ve just started getting into manual focus filming and having a follow focus is crucial. A great review for a great looking product! Thanks for the chance to win one, and thanks for writing this in depth review. Wow, awesome give-away – thanks for putting this on. I use Rokinons with the “cine-mod” as well, and I’ve always been pulling by hand – which definitely isn’t ideal for shoulder mounted on rails. I’d love to get a shot to use this follow-focus, either rented or owned. What are the chances that I would be looking for a good follow focus and hit your comment on Reddit?! Keep up the good work, Joe! This is a great thing you’re doing! As an indie filmmaker, I’ve had to use zip ties and other “creative engineering” techniques to try to get the shots I need. A follow focus is such a useful piece of equipment. I struggled along with hacked solutions for years. I assumed they were “good enough.” Many DIY things really are good enough. The first time I used a real FF and geared lenses was a real eye opener. Would be very hard to go back. Thanks for this! And a nice write-up. Follow focuses are great, and fotga is quite good for the price. If only I could afford it, got to play with it on a rental. Congrats, Anna. You’re the winner! I’ll reach-out via email. Really informative review! Thanks for posting. Currently making a documentary at the moment, so it would be amazing to get this piece of gear. Thanks! Shooting a short in a couple of weeks and the DP and I have been trying to scramble together an effective DIY follow-focus! This is a great review, might have to take a look at the Hondo in the future for a low budget solution. Man, it’s about time I upgraded my gear. This would be so fantastic to have, I’ve always wanted one. Great idea to do a giveaway. I’m keeping my fingers crossed – I’d love to win it! The review indicates that it is a pretty firm piece of equipment. Being a poor uni student in need of a follow focus, it’d be great to win the giveaway! Reviews, ramblings & rants from a dedicated curmudgeon. © Copyright Joseph Moore 2014. All rights reserved.